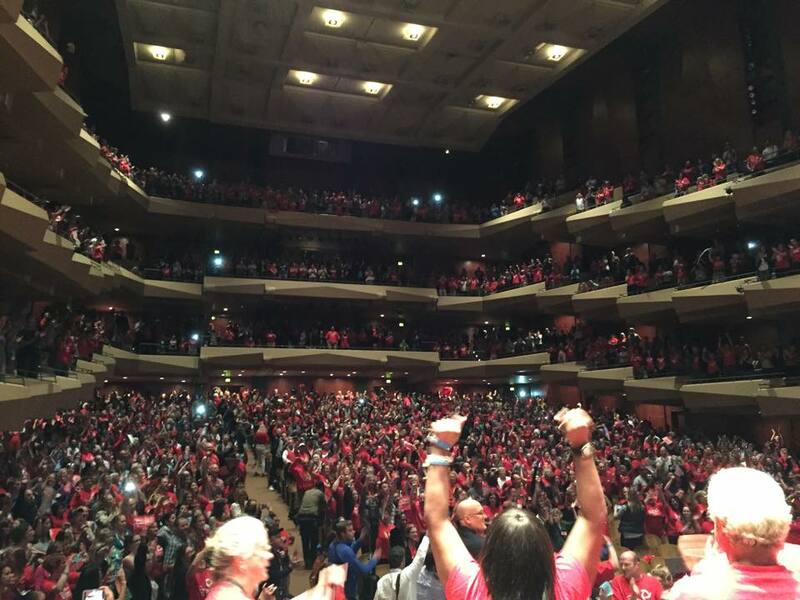 Seattle Education Association members at Benaroya Hall in Seattle at 7:30 PM on September 3, 2015 after teachers vote to strike. Guaranteed student recess: Recess time varies wildly across the district, and we believe all students benefit from a guaranteed amount of time for play and exercise. ESA workload relief: Educational staff associates provide students with crucial services and support, but their current workloads mean many students aren’t getting the help they need. Office professional workload relief: Office professionals do crucial work and play many roles – and they should be compensated for the extra work they do. Student equity around discipline and the opportunity gap: We need to focus on equity issues across Seattle, not just in six schools. Ready to Strike for the Schools Seattle’s Students Deserves! 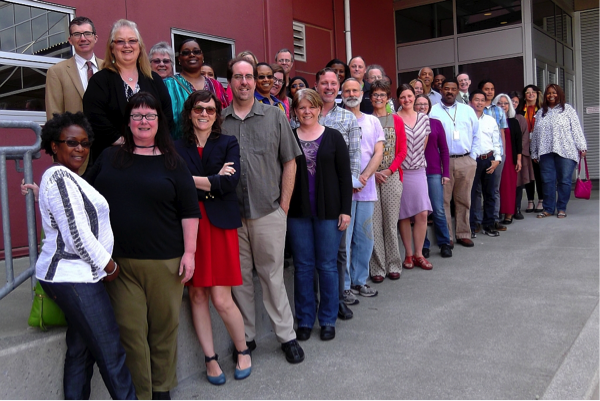 The Seattle Education Association bargaining team. 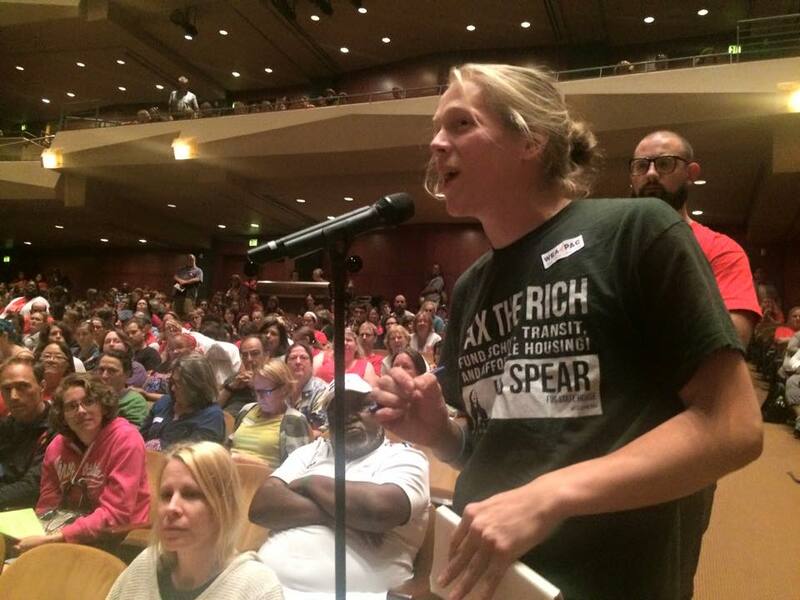 Parents at a Seattle Public School board meeting demanding adequate lunch and recess time. In addition, our union is asking for case load caps for our schools counselors and psychologists so that they can provide the individual attention that all students deserve. At many schools, including Garfield High School where I teach, counselors have hundreds of students on their caseloads and can’t possibly provide them social and emotional supports. At my son’s elementary school this year, the principal had to stop all spending on school supplies like paper and pencils in order to use those funds to save our counselor position. 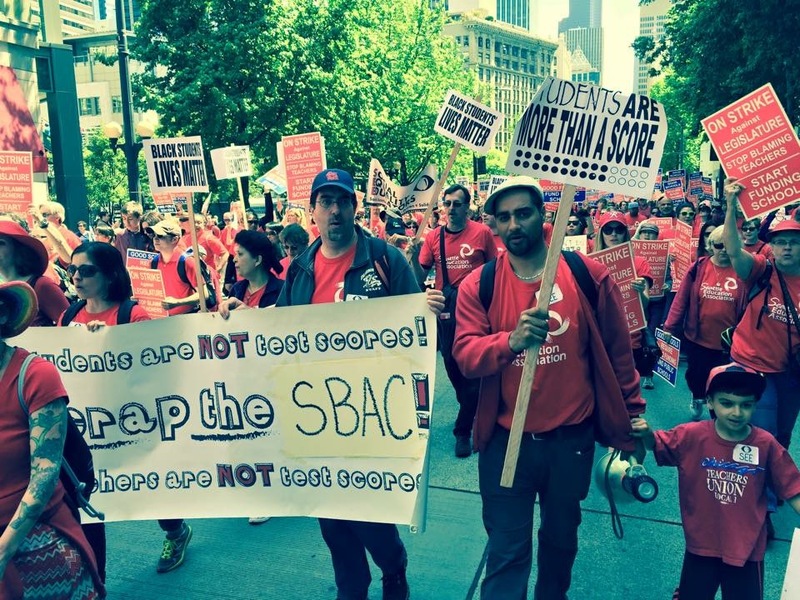 These issues are especially connecting with parents around Seattle and are sure to generate a lot of community support if we do end up striking. As of today educators are asking for a 6 percent raise each year for the life of the three year contract—a minimal increase given the fact that we have not Cost of Living Adjustment (COLA) in 6 years, while the district has received some $40 million in new monies from the state this year and has approximately $50 million in its reserves. The cost of living has skyrocketed in Seattle and it is becoming increasingly impossible for Seattle’s educators to afford to live in the city where they work. Several other school districts around Washington state pay educators more than they do in Seattle, even though the Seattle’s cost of living is by far the most expensive. This is unacceptable and the Seattle School district needs to compensate educators fairly. 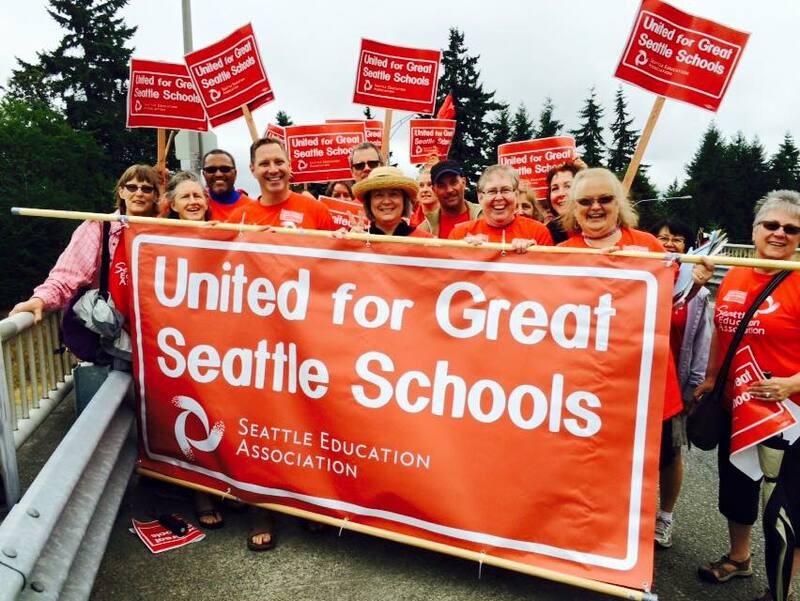 It appears that the Seattle School district has a clear choice: accept our proposals for a just contract that improves education for Seattle’s students, or reject our proposal and trigger a strike. Now it’s time to support our teachers. A little known fact: The teachers on the SEA bargaining team are not paid for the hours they spend in meetings as they did this entire summer. 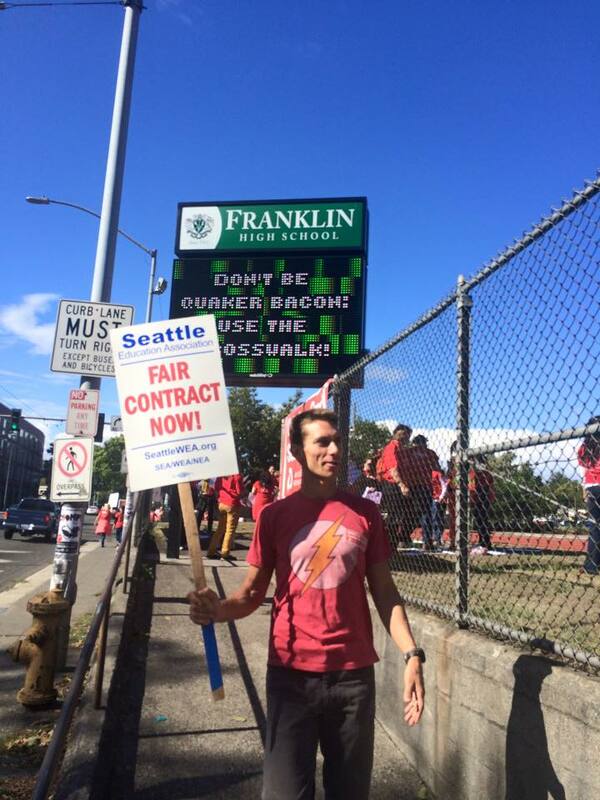 Teachers at Franklin High School in Seattle. 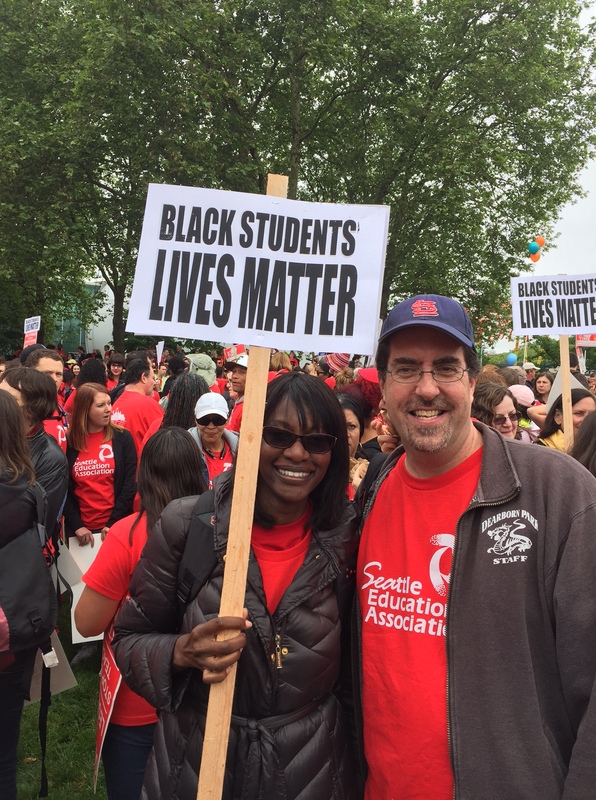 Teachers at the Seattle Education Association meeting held on September 3, 2015. A group of teachers and supporters hold signs along a Northgate I-5 overpass in Seattle, as school district administrators and members of the Seattle Education Association (SEA) met Thurs., Aug., 20 2015, for final contract negotiations. Previous Post: Seattle opt-out numbers for 2014-2015. It’s on! Solidarity from Birmingham, UK – keep fighting for those kids! There seems to be a fairly regular audience in your part of the world. Seattle: stop testing your students excessively! Please trust your dedicated teachers — they are able to foster critical thinking and real learning among the students, far better than any test relying upon rote memorization ever will. As a college professor, I am looking for students who know how to slowly consider all sides of an issue or problem, not students to can brain dump on a test and then forget it all the next day. KUDOS to the SEA officers and members for standing up for what is right . Keep up the good work! Yes, the government and greedy corporatists. Wouldn’t it be great to have the Right to Strike?